Following a couple of false starts that saw F and I hitting at each other’s paddle, we settled into a rhythm and slowly pushed our way north. We were in good form as the kayak glided gracefully along the coast, and the increasingly cloudy sky didn’t even bother us. Afterall, we were already water-splashed; some rain won’t make much of a difference. I stopped paddling from time to time to take photos, but conscious not to leave F doing all the work. 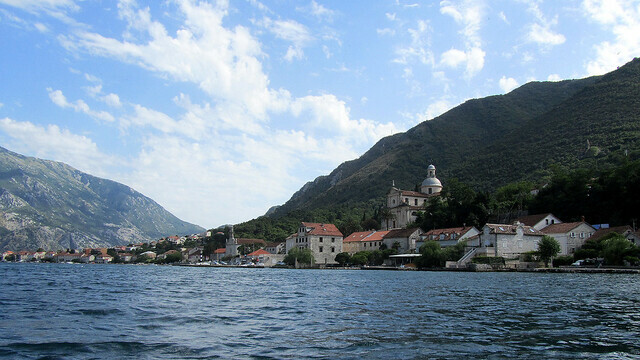 We progressed past the towns of Prcanj and Donji Stoliv, and the views from this side of the water towards land were just magnificent. Occasionally we passed clusters of beaches and piers but they were relatively quiet, perhaps because it was still quite early, or perhaps because the sun was playing hide-and-seek and it was drizzling on-and-off. F declared we should check out the water on this side of the bay, so we docked by a small pebble beach and he snorkelled for a little bit. 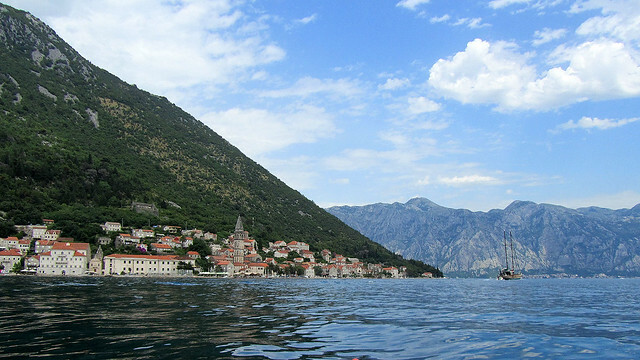 He was content that the water here was much clearer in comparison to that of Kotor. 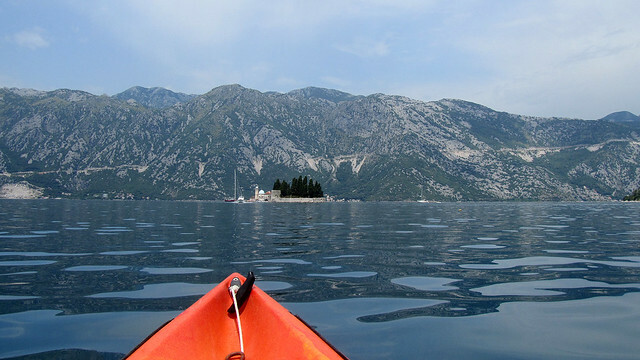 It was time to paddle again, and off we went in the direction of Perast. 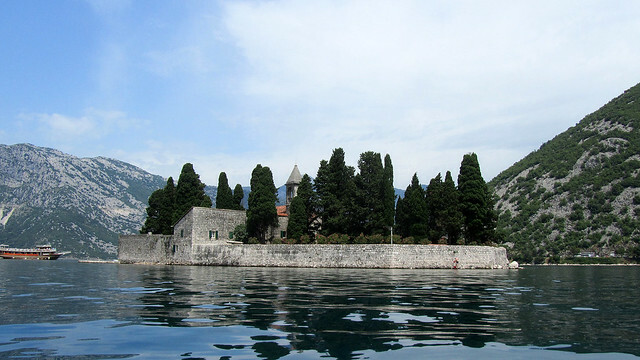 We may have just visited Perast on the previous afternoon, but to see it from the water took our breath away. 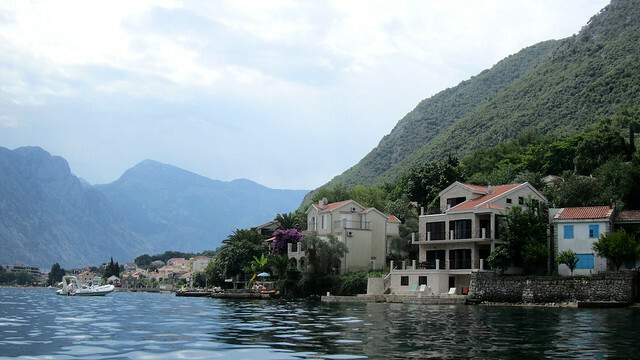 By far the most charming town that we’ve seen around this inlet of the Bay of Kotor! 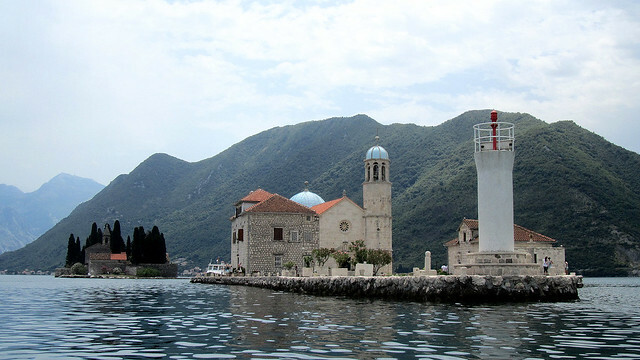 Just off the coast of Perast were the two islands of St George and Our Lady of the Rocks. 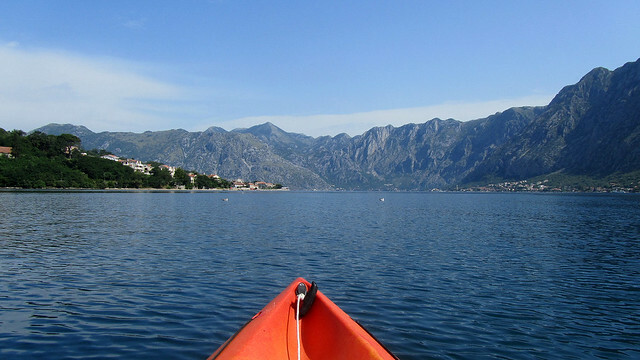 After declining a boat trip just an evening ago, we now had the opportunity to kayak around them in our own time. We really liked St George, known locally as Sveti Ðorðe, that we circled it a number of times. Clearly, these islands are popular tourist spots. 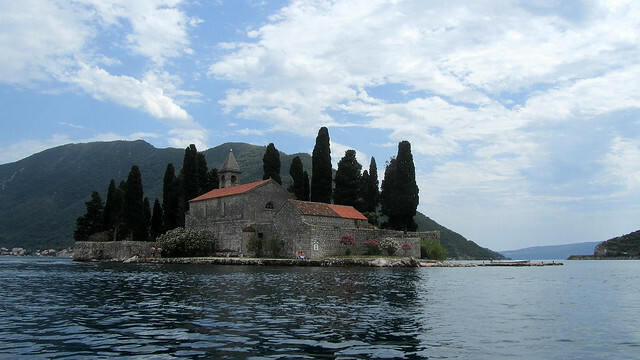 Boats after boats came and went, but we noticed they only stop to let people off at Our Lady of the Rocks, aka Gospa od Škrpjela to the locals. 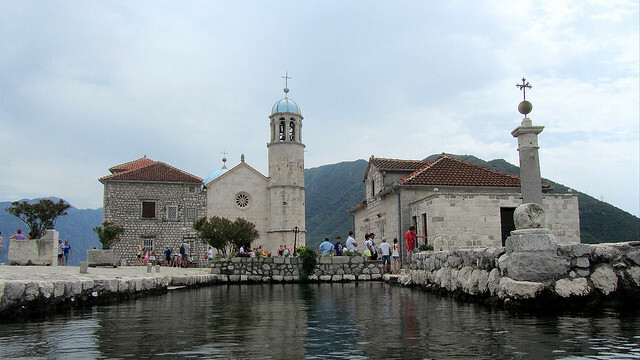 It was pretty much a church, a museum, a gift shop (of course! 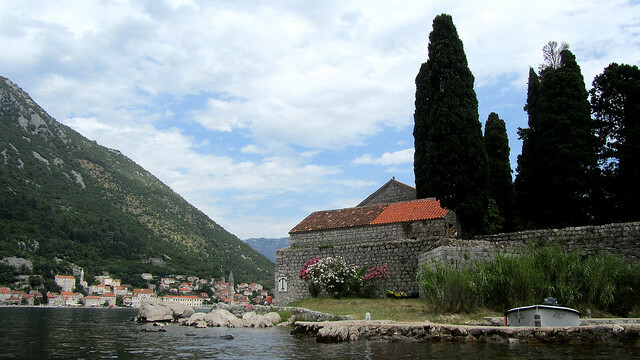 ), and a lighthouse on an island of rock. Not exactly dressed for a church visit, we could not attest the richly ornated Baroque altar nor paintings by Venetian masters within its interiors. 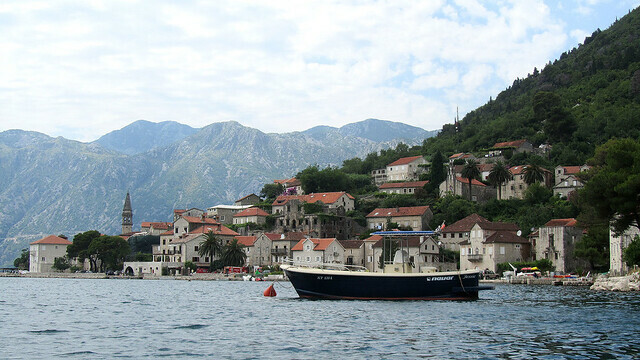 We took a long break in Perast and had lunch with a view on a pebbly beach. 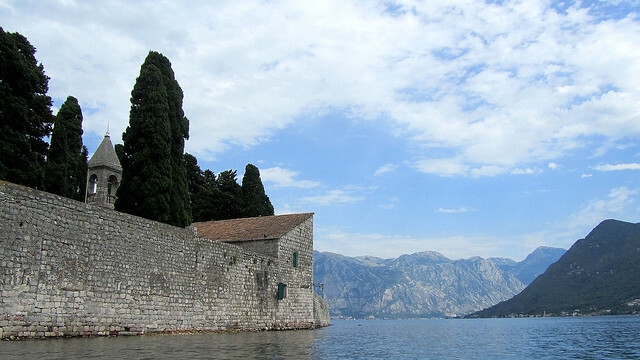 We read, we snorkelled, and we admired the view some more. 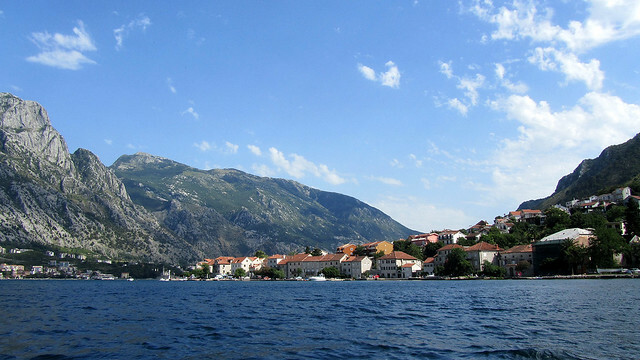 The sky had cleared to give way to a perfect day at the Bay of Kotor. For a moment, we debated if we should stay around and not paddle back until near sunset, but recalling how quickly it became dark in the previous evenings after the setting sun hid behind the mountains, we decided that would be unwise indeed. No kayaking in the sunset for us. What we did have was kayaking in the wind instead! On our way back, the wind started to pick up and blew in the direction that would never help us get back to Mua quicker nor effortlessly. The water was visibly choppier, and apocalyptic scenes from movies where the sea would engulfed us took hold in my imagination. We were getting tired of battling the elements but we could not stop for small breaks either. 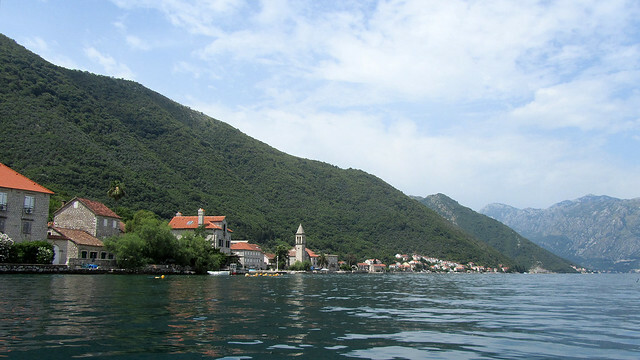 Whenever we did, we drifted further into the middle of the ria and away from the coast, within seconds, undoing minutes of hard paddling towards the coast. Tempers started to fray, and patience began to wane. Luckily, determination and grit took over, and we pushed continuously towards Mua. Our arms ached but we powered on. 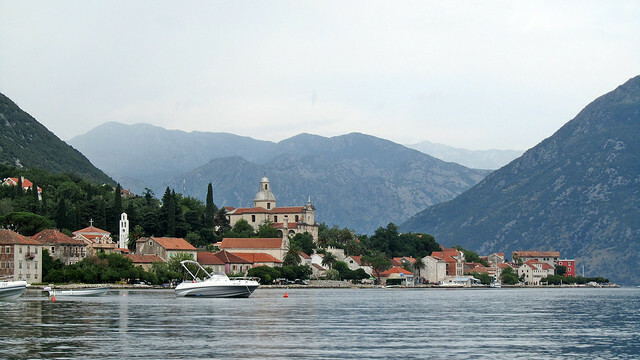 This time, the arrival seemed so far away; unfair, considering our outbound journey in the morning seemed much shorter. We were relieved to finally spot the pier where we kicked off our excursion just a few hours ago. We hoisted the kayak to safe ground, then stood silently to hug each other for a while. I must admit, I was scared. Logically, we could have asked passing boats for help if need be, but out there in the water, I felt we were very much on our own. What an adventure! We had a boat (with a skipper and a couple of women on board) which circled us at one point, just to gawk at us and not exactly checking if we needed help. Instead they sent more waves that pushed us away from the shore when they decided to pick up the speed and leave… oiii.